Every team uses words like "unique," "biggest," and "best" to describe their promotional lineup each season. Do we think those three words apply to the 2019 Fisher Cats Entertainment Experience? Absolutely. But we're not going to use those words, because we're not like every other team. Fresh off an Eastern League Championship, we knew last season's show would be hard to top. We set out to give you a little of the familiar, plenty of new excitement and a smattering of the avant-garde. It all begins with April. Our "Mountain Men" alter ego is back in a big way in 2019. 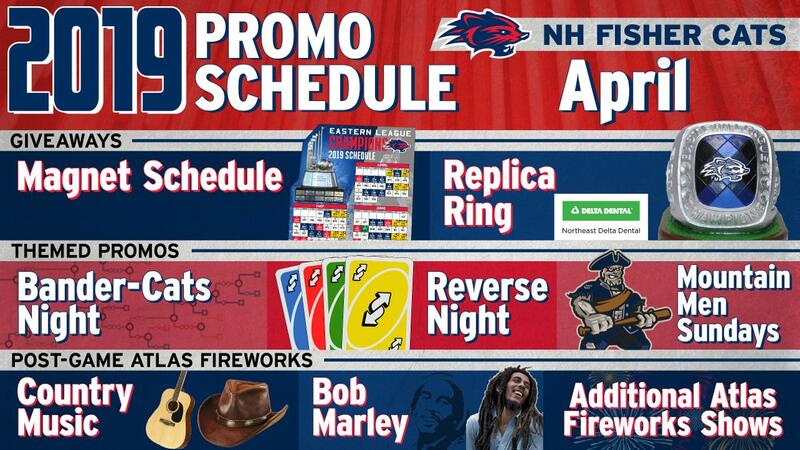 Beginning with April 7, the 'Cats will transform into the New Hampshire Mountain Men for all 10 Sunday home games this season. It's one of baseball's most controversial subjects: how do you maintain the spirit of the game while keeping up with our fast-paced society? We'll ponder that question as we mess with the speed dial all game long. Fax machines. Movie rental stores. Flip phones. No, this isn't a Wednesday night in 2002; it's a celebration of all things outdated! Add this one to your "My List." Every element of the Fisher Cats Entertainment Experience will be turned over to you, for better or for… even better! Let's get together and feel all right with some 'Cats baseball and postgame pyrotechnics set to the tunes of the ubiquitous reggae superstar. One Love! There's no denying our current climate catastrophe, but we'll leave the doom and gloom to the news and Twitter. Join us on Earth Day for a joyous celebration of our collective Mother. We'll start from the end and finish at the beginning. Trust us, it will all make sense when you get here. Tallboy Tuesday and Thirsty Thursday return in 2019. Fans can enjoy discounted beverages before first pitch at all Tuesday and Thursday home games this season.